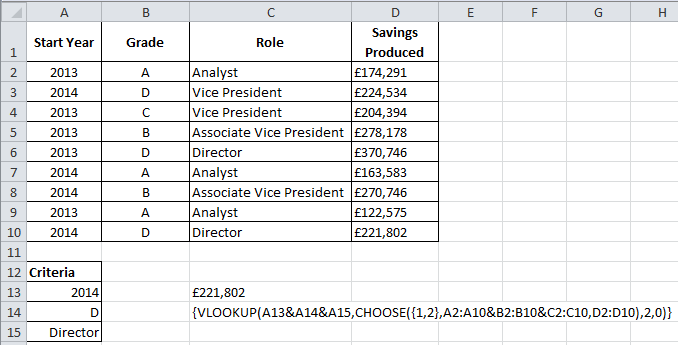 The VLOOKUP formula is = VLOOKUP(lookup_array,table_array,col_index_num, [range_lookup]) Lookup_array – This is the data that is unique and common in both tables. In this example, this is the staff ID from table A. Finish by typing a comma to close the current function.... In other words, the table array needs to stay fixed and not move down a row if you copy the formula down. To make sure the table array is absolute, press F4 to insert a $ before the column & row figures. The VLOOKUP formula is = VLOOKUP(lookup_array,table_array,col_index_num, [range_lookup]) Lookup_array – This is the data that is unique and common in both tables. In this example, this is the staff ID from table A. Finish by typing a comma to close the current function.... Vlookup Column Index trick. One of the problems with the VLOOKUP function is how information is pulled through by making reference to the column number in table of information. If TRUE or if this argument is omitted: VLOOKUP returns either an exact match to the Lookup_value or, if an exact match is not found, VLOOKUP returns the next largest value. For the formula to do this, the data in the first column of Table_array must be sorted in ascending order . how to make vegetable toys If TRUE or if this argument is omitted: VLOOKUP returns either an exact match to the Lookup_value or, if an exact match is not found, VLOOKUP returns the next largest value. For the formula to do this, the data in the first column of Table_array must be sorted in ascending order . Now we need to enter a value for the Table_array argument. In other words, we need to tell VLOOKUP where to find the database/list. Click on the selector icon next to the second argument: In other words, we need to tell VLOOKUP where to find the database/list. 17/05/2013 · Hi All, I have a problem in Excel 2007 in which VLookUp is not working in two different workbooks. When I am trying to do the VLookUp it doesn't go to the second sheet to select the table array. When I am trying to do the VLookUp it doesn't go to the second sheet to select the table array. This seemed to work for me: =INDEX(vData,LARGE(IF(vIndex=iValue,ROW(vIndex)),ROW())) Array entered. vData is the values to pull out, and vIndex is the data to match up, and iValue is the data you're searching for in cell A1. Updated the table_array argument each time the data changes to include the additional data (this method requires regular updates/changes to the VLOOKUP formula). Inserted the new rows into the existing table_array , rather than at the bottom (this method requires you to remember to insert them into the middle and not at the bottom. Always check which cells are being highlighted for the lookup table. Make sure you don’t miss any parts of the table! If you are creating multiple vlookups, make sure the references are locked so the vlookup formula does not shift while copy and pasting.